Lamenting tardiness and recurring issues of non-clarity in the nation’s budgeting process, he listed the proposals by Public Complaints Commission; Independent National Electoral Commission (INEC); National Judicial Council (NJC); and Niger Delta Development Commission (NDDC), as a violation of the rules. “INEC has N45.5b; NJC, Abuja, N110b and NDDC N95.19b. No one is permitted under democracy to spend public funds in a way and manner not known to citizens, who are the ultimate sovereigns,” he said. “The NDDC has a vote of N95.1b; Ministry of Niger Delta N41.6b; while the Amnesty Programme has N65b, amounting to N201.7b. The Niger Delta Master Plan should be the basis of budgeting instead of the current uncoordinated approach. 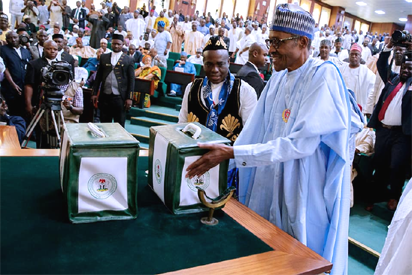 “At the Office of Secretary to the Government of the Federation (SGF), the North East Development Commission was awarded N10b, when Service Wide Vote of N45b captured same,” he stated. “This stultifies competition and value for money in public procurement. And the vehicles frequently demanded are foreign brands that should compete with made in Nigeria brands in accordance with the Executive Order on Local Content in Budgeting and the National Automobile Policy.